Dummy tiers are essentially polystyrene blocks. They come as rounds or squares and can be straight edged or rounded. Cake dummies are used most commonly for display cakes. These are for wedding shows, window displays, photoshoots etc. They are also used in addition to real tiers on a wedding cake to add height or drama to the cake where no more real cake is needed. If a bride has her heart set on a 5 tier but she only has 150 guests, she can add a large dummy tier to the bottom of the cake which will be decorated in exactly the same way as the main cake, so no one will ever know! They’re also good to practice new techniques on and double up nicely as a kids giant tower building set. 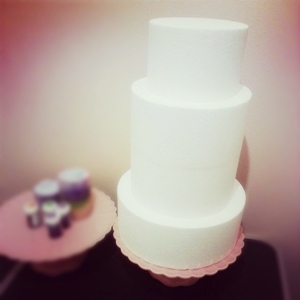 Polystyrene dummy tiers for a magazine shoot, before being covered in sugarpaste. Are they cost effective for weddings? They can be. The answer to this depends on who is making the cake, and what size dummies you’ll need. It’s unlikely that you’ll find difference in price between a 4″ cake vs a dummy. However, if you wanted to add larger tiers to your cake (like 14/16/18) then you may find a difference in price. Just remember, it won’t make your wedding cake cheaper as you’ll still need to order enough cake to serve your guests. Use dummy tiers if you want to save money by having a fully decorated dummy cake and using serving or kitchen cakes. The amount of cake you’ll have to order will be the same. Use dummy tiers to add more height and detail to your design without the extra cake. 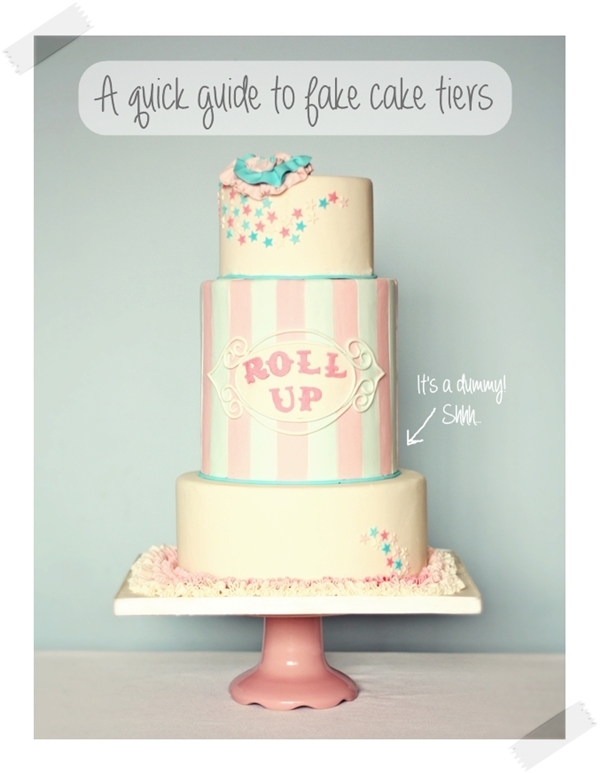 Remember that traditionally the bottom tier of the cake is cut, so bare this in mind if you’re thinking of bumping up your cake with a large dummy. Can you use a simple buttercream frosting to decorate on dummy cakes?